The renewal date is March 31st of even years. Once you complete the course, you can immediately download and print your certificate. You can download the course by clicking on the “View Course PDF” link below. 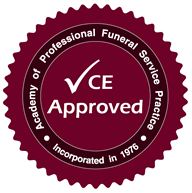 Course type: Licensees may take self-study online and classroom-based funeral CE courses. Study recommendation: Students should read the course material prior to taking an open-book, non-monitored final exam.